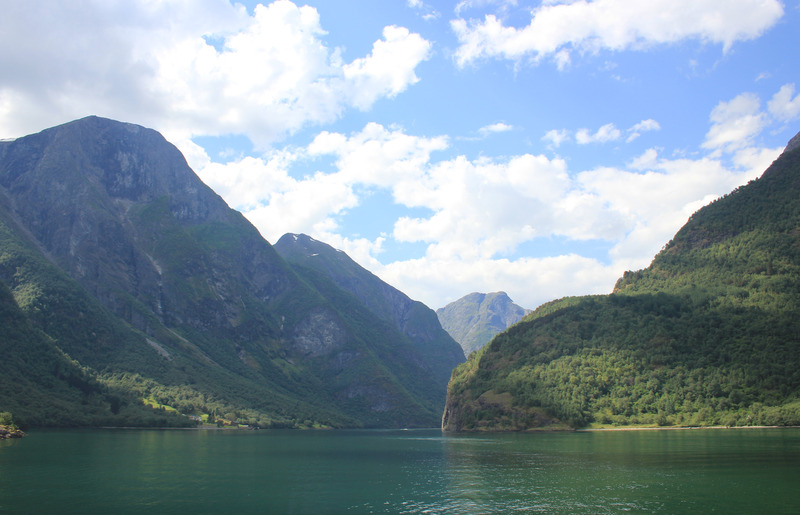 The fjords. Wow. We crowded onto the top deck and lined the sides, jostling for the best photo positions. Amidst all this wide open space and the expansive vistas I felt as if we were a herd of cattle being transported from one place to another (which of course we were). All the same, what views! There was a boat further ahead of us; a tiny speck in the far distance. I took out my zoom lens and began to understand the scale, and not just the beauty, of where we were. 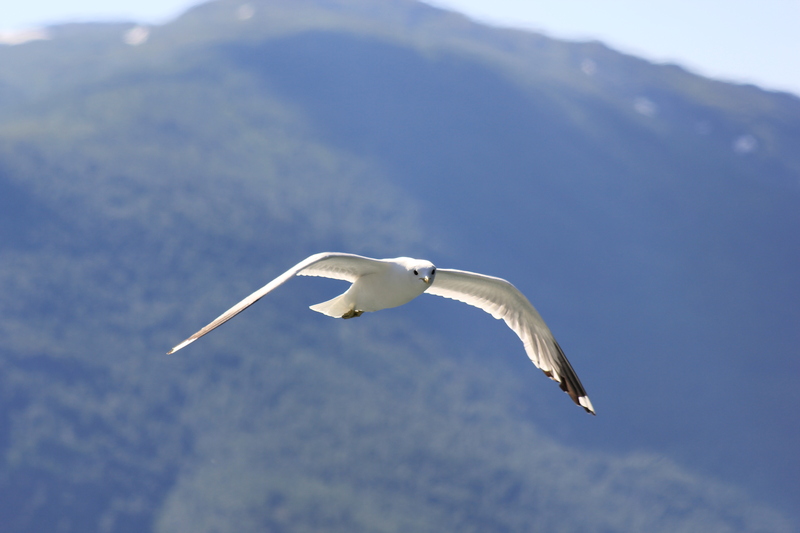 Seagulls flew alongside us. The tourists threw bits of bread at the gulls and were delighted when the gulls caught them in mid-air. You could tell the gulls were practiced in this art. 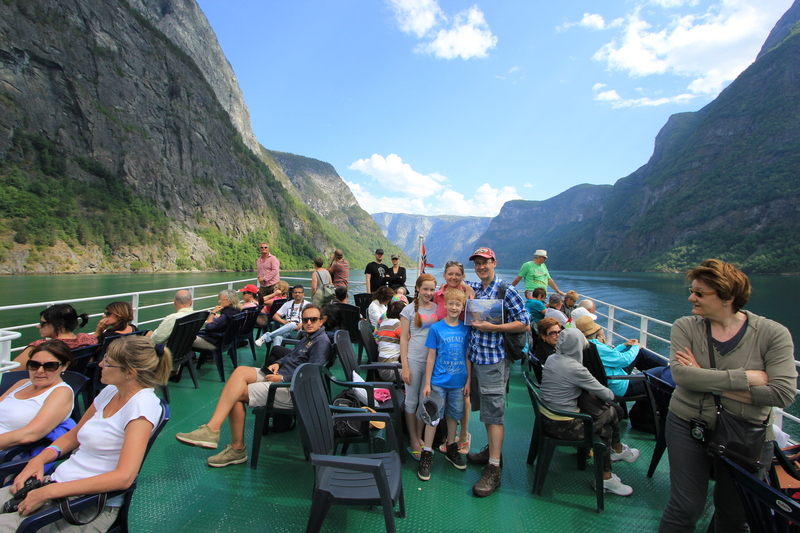 Our tour took us up Aurlandsfjord and into Naerøfjord. The latter is a UNESCO World Heritage Site. 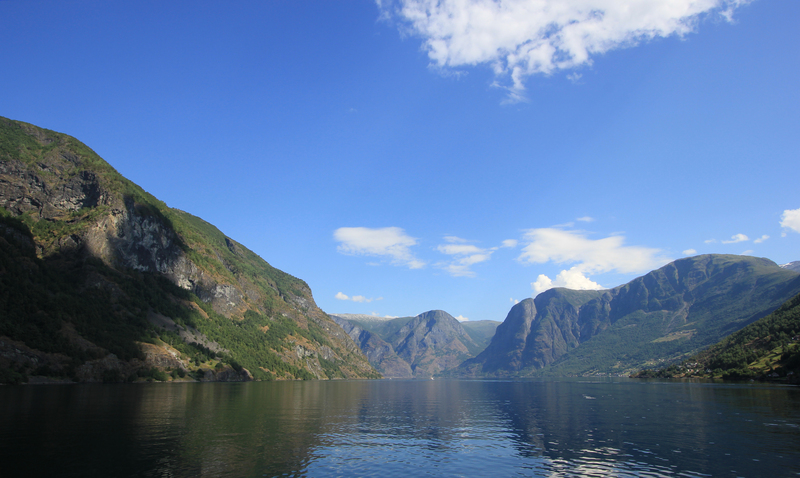 Naerøfjord is 11 miles long, and in some places only 500 metres wide and 15 metres deep. 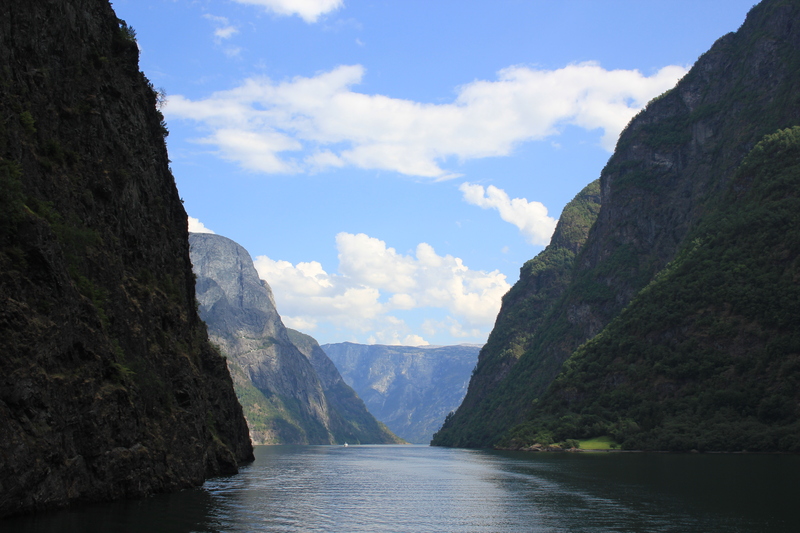 It is the narrowest and shallowest navigable fjord in the world. 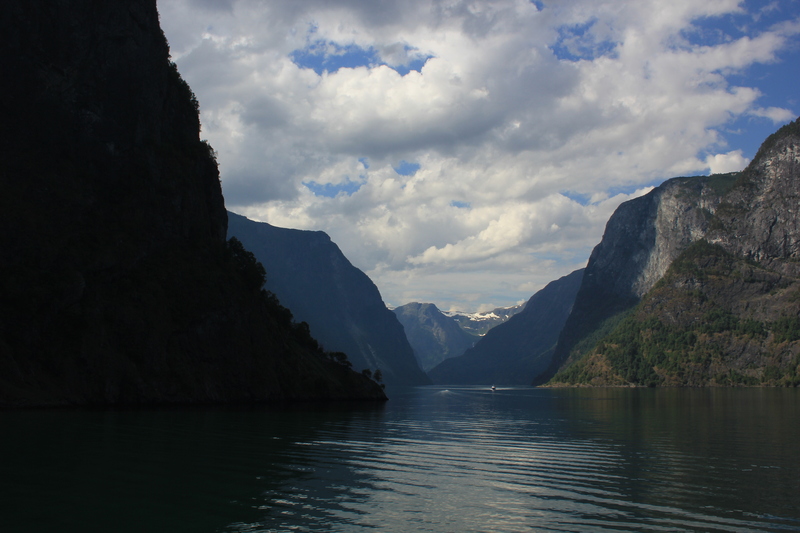 As we sailed down Naerøfjord I reached into my backpack and took out a copy of the picture hanging in our hallway. This was our original inspiration for coming here – to say we had been to the very place depicted in the painting. 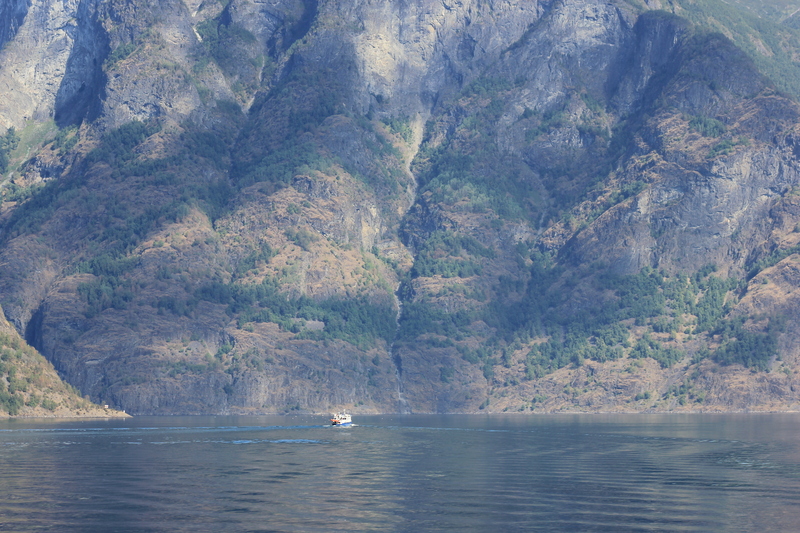 We studied the towering sides of the fjord that surrounded us and tried to match them with those shown in the painting. Of course, the view in the painting was from the shoreline whereas we were in the middle of the water, so the perspective was different. The artist’s impression did not seem to match exactly with the landscape we were looking at. As cliffs and peaks fell into place others fell out. But then, although parts of the foreground looked different to that shown in the painting, the background suddenly seemed right. Were we here? To be honest I have no idea, but it was as good as we were going to get. Mission accomplished, we sat back and enjoyed the views for the remainder of the tour. Views like this. And like this, at one of the narrower points of the fjord. Some parts of the landscape were peppered with waterfalls. The waterfall cascade at the end of the trip, at Gudvangen, was particularly impressive. What a finale! 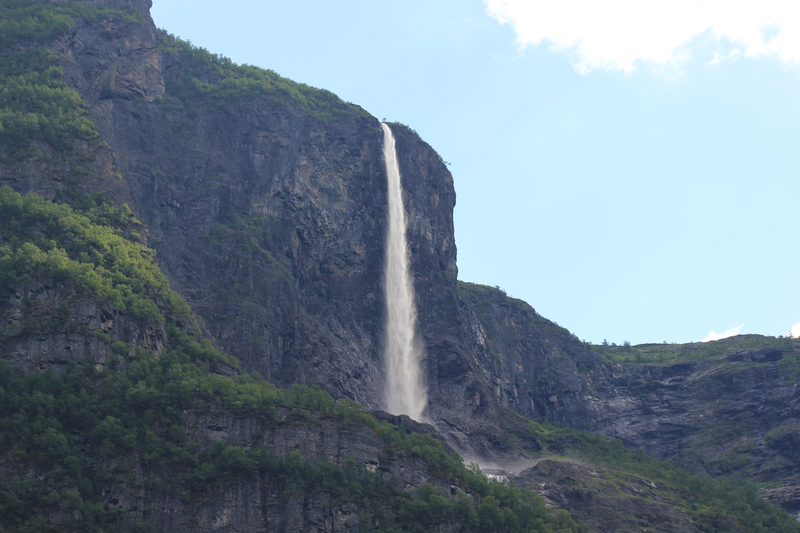 This entry was posted in Norway and tagged Aurlandsfjord, fjords, Gudvangen, gull, Naerofjord, Norway, travel, waterfall. Bookmark the permalink. 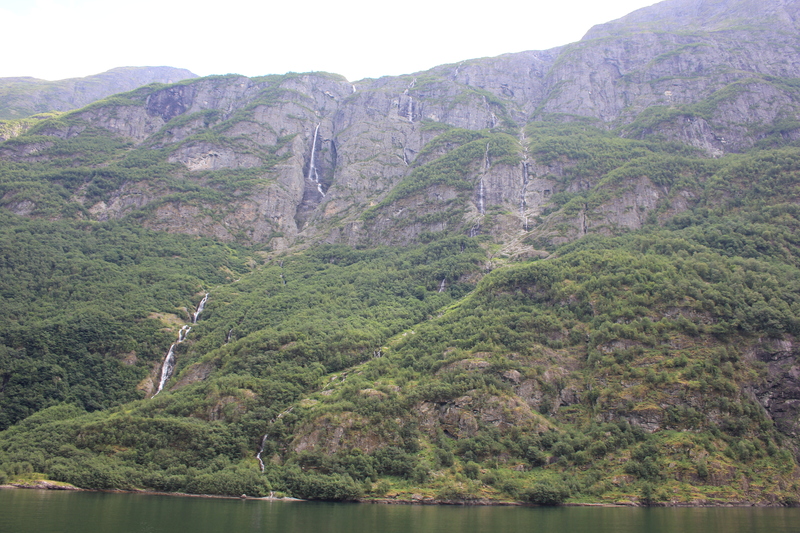 Fabulous fjords; it’s looks almost like the ones in NZ.